Life on Wheels [SPECIAL EDITION] Week 73 – Enough Is Enough! 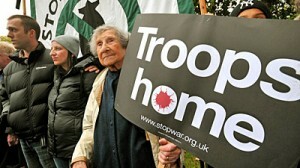 On Saturday, 20th Nov 2010, ten thousand protesters joined a march calling for the immediate withdrawal of troops from Afghanistan. Ceasefire contributor Jody McIntyre was one of the speakers. This is his speech.